ETAS® is an innovative extract obtained from asparagus, which alleviates the effects of stress by controlling the levels of cortisol. 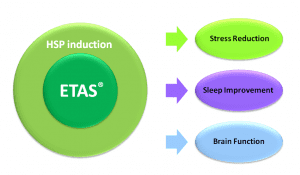 ETAS® also shows a clinically validated efficacy for sleep improvement, support of mood and cognitive function, and protection of neuronal cells. Most of ETAS® beneficial effects derive from its capacity to induce cytoprotective heat-shock proteins. Asparagus (Asparagus officinalis) is used in traditional medicine for its multiple health-supporting properties including diuretic, hypolipidemic and hypoglycemic effects. Researchers from Japanese universities, and from the Hokkaido-based company Amino-Up Co., have uncovered a new property of Asparagus. Amino-Up’s proprietary ingredient ETAS®, obtained from the lower part of Asparagus stalks by a specific extraction procedure, displays clinically proven benefits on stress-relief, sleep control, and cognitive function. The active molecules in ETAS® have been identified as Asfural and Cyclo (L-Ile-L-Pro). ETAS® beneficial effects mostly derive from its capacity to induce the expression of a major stress-response protein: Heat Shock Protein 70. Stress contributes to various psychological disorders such as insomnia, depression, and fatigue. Stress-induced release of the steroid hormone cortisol also leads to physical dysfunctions: immunosuppression, reduction of bone formation and collagen synthesis, damage to neuronal cells. HSPs are actually called “stress proteins”, since their expression is induced by physical, chemical and biological stresses, but also by psychological stress. HSPs contribute to protect our cells against the deleterious effects of stress. 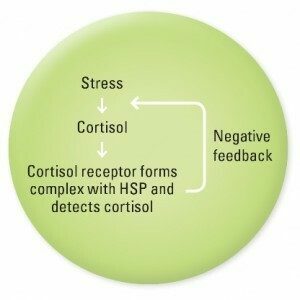 They also play a crucial role in the negative feedback system which controls cortisol levels: activation of the glucocorticoid receptor, which down-regulates cortisol production, requires both HSP70 and HSP90. ETAS® effect on HSP expression and stress-related markers has been evaluated in several animal and human studies. Consumption of ETAS® leads to an increased expression of HSP70, and a control of the stress markers cortisol and chromogranin A levels in serum and saliva. Sleep disorders are commonly associated with stress, and have a serious impact on daytime functioning and quality of life. A human clinical study has shown the ETAS® intake could improve the quality of sleep in people with low sleep efficiency or excess sleep time. It is thought that ETAS® can adjust the succession of rapid-eye movement (REM) and non-REM sleep, leading to better sleep quality and more adequate sleeping time. In the central nervous system, induction of HSPs exerts a protective effect in pathological situations such as neurological injury or neurodegenerative disease (Parkinson’s disease, Alzheimer’s disease). Two in vitro studies have actually shown that ETAS® is able to protect neuronal cells from chemical stresses and amyloid beta-induced damages. These neuroprotective effects may be mediated by HSP induction, but may also result from a direct antioxidant activity, since Asfural displays some natural free radical-scavenging activity. Consistent with its protective effect on neuronal cells, ETAS® was found to attenuate cognitive impairment in senescence-accelerated mice, with a prevention of memory decline. In healthy individuals subject to stressful conditions, ETAS® treatment led to an improvement of psychological and cognitive rating (increased number of correct replies to functional tests, improvement of fatigue feeling and mood). These data confirm the potential of ETAS® as a support for cognitive function and mood, in people suffering from fatigue, excess stress or age-related impairments. Ito et al. 2013. Isolation, structural elucidation, and biological evaluation of a 5-hydroxymethyl-2-furfural derivative, asfural, from Enzyme-Treated Asparagus Extract. J Agric Food Chem. vol. 61(38), pp. 9155-9. Ito et al. 2014. Enzyme-Treated Asparagus Extract promotes expression of Heat-Shock Protein and exerts antistress effects. J Food Sci. vol. 79(3), pp. H413-9. Ito et al. 2014. Effects of Enzyme-Treated Asparagus Extract on Heat-Shock Protein 70, stress indices, and sleep in healthy adult men. J Nutr Sci Vitaminol. vol. 60(4), pp. 283-90. Sakurai et al. 2014. Enzyme-treated Asparagus officinalis extract shows neuroprotective effects and attenuates cognitive impairment in senescence-accelerated mice. Nat Prod Commun. vol. 9(1), pp. 101-6. Ogasawara et al. 2014. ETAS, an enzyme-treated asparagus extract, attenuates amyloid beta-induced cellular disorder in PC12 cells. Nat Prod Commun. vol. 9(4), pp. 561-4. Takanari et al. 2016. Effect of Enzyme-Treated Asparagus Extract (ETAS®) on psychological stress in healthy individuals. J Nutr Sci Vitaminol. vol. 62(3), pp.198-205. Ito et al. 2014. Toxicological assessment of Enzyme-Treated Asparagus Extract in rat acute and subchronic oral toxicity studies and genotoxicity tests. Regul Toxicol Pharmacol. vol. 68(2), pp.240-9. Please contact us for more information about ETAS.